In the mid-1980’s, I volunteered to assist at a seminar including a ropes course, a physical challenge designed to have participants go past their emotional or mental “blocks.” I was really looking forward to seeing people free themselves from their worry or inhibitions while rappelling across a canyon. As an outdoor lover, it seemed like the perfect thing for me to do. The first night of the seminar, when only the fifty or so assistants met, I was told (in front of everyone) that I would not be allowed to go on the ropes course, and that I would be staying at the lodge to assist with other tasks. We’d had weeks of preparation, mostly psychological, and I was deflated by this unexpected news. The next morning, we went on about our functions and I lived in disappointment. Then at lunch time I was out in front of the main building with several people chatting aimlessly and the course doctor, who was an athletic, sweet, kind, man, approached me and asked to discuss my experience in the program the evening before. He asked if I was still upset, and I began to cry. He looked into my eyes and I could see that he understood my deep disappointment, in that I was going to miss the best part, the part I had specifically come for. And then he said to me, “Francine, you can’t go because handicaps dominate. Your handicap would dominate the mountain. Do you understand what I mean?” I replied that I had no idea what he meant, and he quietly explained that if I went on that course, everyone there would be concerned for me. It would all be about me. That everyone would be concerned for my safety and comfort, because I was handicapped. It was as if a curtain had opened on the drama of my own life. I had never, ever seen myself that way. I was so independent, and I handled my own problems so well; indeed, always expected to handle them and rarely asked for help even when I needed it. 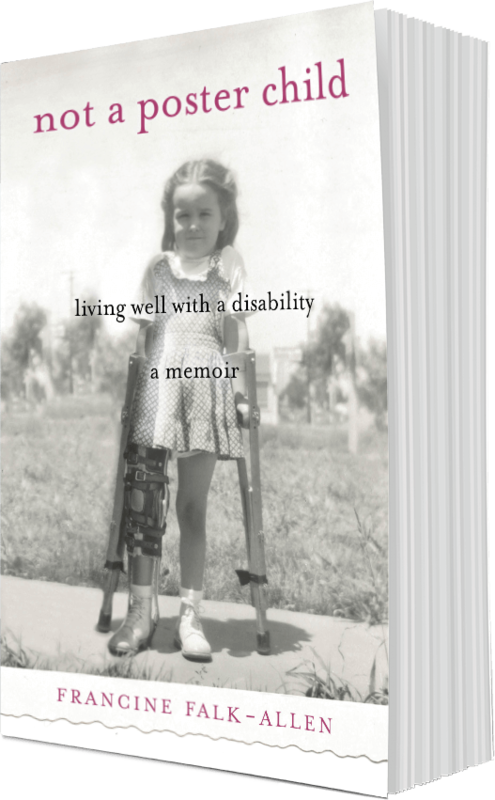 In fact, I felt so powerless about so much of my physical life, so much at effect more than having any effect at all, that the concept of a handicap dominating any situation had seemed at first absurd to me. But I saw that it was true. And, I was at this program to be invisible and facilitate others, not to be the center of attention. Then he apologized that no one had told me I was not going to be able to go on the ropes course assisting team. How healing is apology, even when the one saying “I’m sorry,” is not at fault. This conversation with this kind and compassionate doctor enabled me to remain there on the course with enthusiasm instead of with resentment, anger and regret. Download a free handicap-related list of resources excerpted from Not a Poster Child. Enter your email address to be included on my contact list.